School students, facing a lifetime of climate chaos, have every right to protest in the streets. A few words last week from Scott Morrison and his resources minister, Matt Canavan, could only have widened an already obvious gap between them and Australian youth. A placard at the 1000-strong school students’ climate protest in Hobart on Thursday, one of the prime minister’s targets, retorted “If you were smart, we would be in school”. Morrison is dead wrong to imply that activism and education are mutually exclusive. The students in the streets last week had a first-rate learning experience, while also airing their knowledge of climate change science and how the world has responded to it – or not. They have applied critical thinking, the essence of a good education, to the climate problem, and understand better than many of their elders the cloud that hangs over their future and the utter inadequacy of Australia’s response. For his part, Matt Canavan wants students studying geology to learn how to make mines and drill for oil and gas, “one of the most remarkable science exploits in the world”. He went on: “The best thing you’ll learn about going to a protest is how to join the dole queue. Because that’s what your future life will look like, in a line asking for a handout, not actually taking charge of your life and getting a real job.” That is, activism is a fast track to unemployment. That sort of statement is a fast track to electoral oblivion. All these students will eventually be voters, a few of them as soon as next year. Of all people, they are most damaged by government failure to act effectively against rising emissions. They have every right to be angry. This year, much of northern Europe had its hottest summer in 250 years of records. Sweden was hit especially hard, experiencing its first significant wildfires in forests close to the Arctic Circle. In August, a 15-year-old Stockholm girl named Greta Thunberg decided to take her country’s leaders to task. 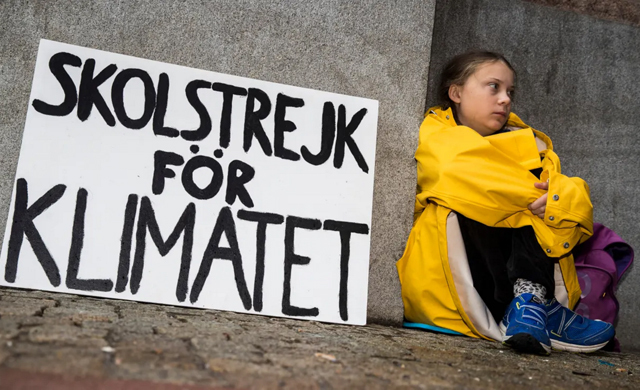 Every day for three weeks she sat on the pavement at the main entrance of her country’s parliament, next to a large placard reading “School Strike for Climate”. “What am I missing? What am I going to learn in school?” said Thunberg to a Guardian reporter. “Facts don’t matter any more, politicians aren’t listening to the scientists, so why should I learn?” She did, however, read books and do homework during her strike. Sweden has enacted some of the world’s most ambitious climate measures, but Thunberg cited current scientific analysis to show that to limit warming, even these need to be stronger. If Sweden needs shaking up, how much more does Australia, which addresses climate change by ignoring fossil fuels and managing trees, land and waste instead? Applied to the whole world, our Paris targets would land us in a global catastrophe by mid-century and probably well before. A trio of high school students in Castlemaine, Victoria – Milou Albrecht, her brother Piper and her friend Harriet O’Shea Carre – decided to follow Thunberg’s example. Promoted on social media, their idea for a “School Strike 4 Climate Action” took off across the country. In every capital city last week thousands took to the streets, while students in smaller centres found their own ways to air grievances about government inaction. Kimball Johnston was generations removed from these students, but he would have warmly applauded their protest. He gave countless hours of his time to the cause of raising environmental awareness, until his sudden death in Hobart, two days before the school strike. He didn’t promote himself, or air his views like I do. He expressed his passion for a better world by being there when things needed doing, and by knuckling down and doing them. His many friends who have shared his love of nature, me included, mourn his loss. This entry was posted in agriculture and farming, Australian politics, Australian Youth Climate Coalition, carbon emissions and targets, changes to climate, climate system, community action, education, environmental degradation, forests and forestry, fossil fuels, future climate, human behaviour, international politics, land use, leadership, youth activism and tagged Castlemaine, Greta Thunberg, Harriet O’Shea Carre, Kimball Johnston, Matt Canavan, Milou Albrecht, Piper Albrecht, Scott Morrison. Bookmark the permalink.